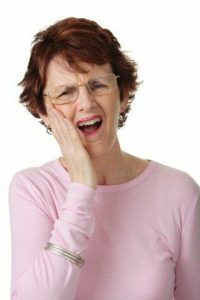 Are your Dentures Causing Pain? There used to be a time when the only solution to missing teeth problems is to have dentures. The artificial teeth can easily be created in a short period of time, and will be designed to perfectly fit inside the mouth using the patient’s specific measurements. Dentures were considered as quick, reliable solutions to a toothless condition. However, the removable nature of dentures will eventually pose a problem for the denture wearer especially with long term use. The dentures are created to fit comfortably inside the mouth, using the patient’s unique mouth measurements as a guide. However, tooth loss results in mouth parts and the jawbone undergoing a number of changes as years go by. Without natural tooth roots, the jawbone gradually deteriorates and becomes thinner. Dentures that were once comfortably fitting will become loose, causing uncontrolled movement inside the mouth. The frequent friction against soft mouth parts results to a great deal of pain and embarrassment for the denture user. Do you have loose dentures? Dental implants at Life Dental Implants are ideal solutions for your denture problems. The implants are used to secure the implants in place to stop the uncontrolled movement. The teeth replacements are made more comfortable to use, because they are held firmly in place by the implants. Normal activities such as eating, smiling, laughing, and speaking clearly are easier to manage when teeth stay in place. You can also say goodbye to the embarrassment of having dentures that can fall out of the mouth at any given time!